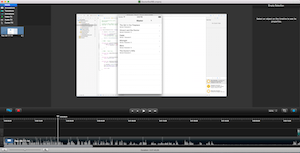 So, ever since I did my first Swift screencast on my YouTube channel, I’ve been hooked on Screencasting. Earlier this month, I let you guys know that my first Dimecast was up and that just broke open the floodgates. To date, I’ve done a total of 7 Dimecasts this month (with number 8 coming in the next few days). I already linked to my first one, but here are the others that I’ve done. I’ve also made all of the code available on GitHub for everything that I’ve done and I will for every Dimecast that I will do. I’m having an insane amount of fun making these videos. I really enjoy it. I like thinking of topics that I can cover, inventing projects for them, practicing, recording, and even editing. The biggest difficulty that I’m facing is that I don’t have a quiet place to record. I have to either get up very early or stay up very late to be able to get ~10 minutes of silence. Even then, it doesn’t always work out and I have to wait and then edit out the noises or else there is occasionally some noise in the background. Even with that hassle (and setting aside my fantasies of a sound-proof “studio”), I’m finding this entire creative process very fulfilling and I hope that people are getting value from it.